Only a few sleeps to go to the Sydney Teddy Bear Fair 2011. I wish I was there. Maybe again next year. 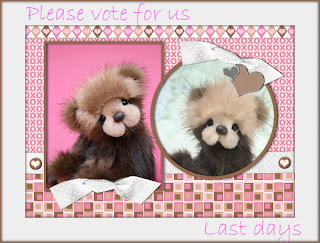 Tiger Lilly and Lil Lilly would love your votes. or by clicking on the side button "vote for us"
Thanks from Tiger Lilly, Lil Lilly and Me! Lil Lilly and Tiger Lilly are proud finalists in the Sydney Teddy Bear Fair 2011! If you would like to support them in the Peoples choice, they would just love it. Please got to the site to cast your vote on these and many others. "See all the finalists & Vote Here"
Well done to everyone who has a nomination!